We offer repair and installation of sectional commercial doors. Common repairs to these types of doors include replacement sections, springs, cables, tracks, and rollers. Same day repair in some cases. We also repair and install other types of overhead commercial doors. Call us at 678-714-7393, or contact us online for more information on our commercial door services. We understand that having an inoperable door can bring business to a halt. Many places of business use sectional overhead doors on loading docks or for access to interior areas. When components fail, or when sections are damaged, we can provide timely service to get you back on track. We keep our service vehicles well stocked, and we’ll perform repairs on the first visit, if possible. We offer same day service, in most cases, for repairs on sectional doors. 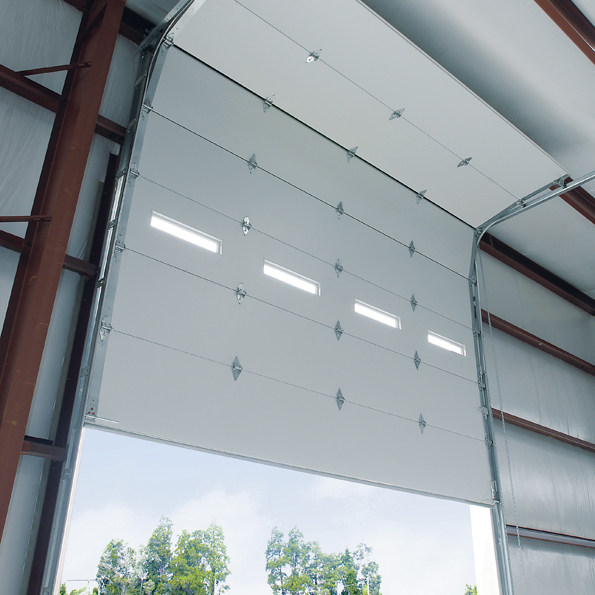 We install many different brands and models of sectional overhead doors for commercial settings. We can help with finding the right doors that fit your criteria and budget, making the process of replacing a damaged door or installing a new door as painless as possible. Many options are available when considering a new door. Different color choices, insulation and window options are plentiful. Contact us today for a quote on a new sectional door online, or at 678-714-7393.